Contextual backlinks are inbound links to a web page or URL that have been defined by anchor text at the originating end. While “anchor text” is commonly used to describe any text that contains an embedded link, “contextual” is a little more exact in its relevance to the destination information. The term “contextual” refers to the fact that instead of merely linking to a new URL without any type of definition, the originating site administrator has added context to it by linking it from a relevant word or phrase. Backlinks or Inbound Links (IBL's) are links that are directed towards your website and are the building blocks to good Search Engine Optimization. The number of backlinks a website has is in a good indicator of its popularity or importance with search engines. 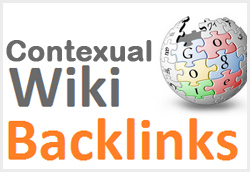 give you 200+ wiki articles contextual backlinks is ranked 5 out of 5. Based on 116 user reviews.